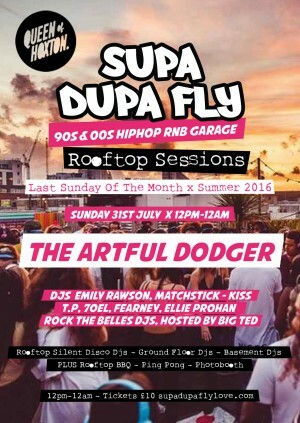 ‘London’s best RnB night’ Time Out… Supa Dupa Fly has become THE necessity in many 90s & Noughties Hiphop, RnB & Garage lovers diaries, selling out every weekly event for the past 5 years, and becoming unquestionably the biggest event of it’s kind in the UK. Supa Dupa Fly have hosted shows for artists including Jazzy Jeff, EZ, Rita Ora & Disclosure with recent impromptu performances from Amerie & Professor Green, and special guests including Emeli Sande & Lion Babe. Hosting arenas at festivals including Lovebox each year, as well as lots of high profile shows at Shoreditch House have been some of the many highlights. There have been numerous recent press features from the likes of Time Out, The Guardian, The Metro and The Evening Standard. Expect 90s, Noughties Hiphop, R&B from Beyonce, Aaliyah, TLC, R Kelly, Missy, Usher, Destiny’s Child, J.T & more! We throw in more new jams too, salute Kendrick, A$AP, Drizzy & all our UK crew!